You might not know what that is yet, but I intuitively know that you want to have it! I know this because my intuition has been freed and magnified by reading The Intuition Principle, by Angela Artemis, author of the blog Powered by Intuition. The great news is that this wisdom is innate in all of us. Angela’s book helps us recognize various forms of intuition, expand our own intuitive skills, and apply them in our lives with deep and lasting benefit, to us and to the world. When I started reading this book, I got chills – no kidding. Angela’s words resonated so strongly that my body vibrated in response. But don’t dismiss this as woowoo magic. Einstein himself, in one of the many memorable quotations in the book, said that our intuition is a sacred gift. Indeed, Angela’s explanation and teaching of the Intuition Principle are impressively grounded in research and science. But don’t forget the fun! Before I read the book, I understood the connection between intuition and wisdom, but I didn’t understand fully the connection between intuition and joy until Angela explained it. Then is was so obvious. In fact, one of the main benefits to living by the Intuition Principle is increased joy and well-being. The fun starts with a pop quiz to see how intuitive you are. But don’t worry! You’ll see that you already are using your intuition, even when you don’t know it. For example, you might think of someone who then calls unexpectedly, or you make a choice that doesn’t have an obviously rational basis but turns out exactly right. Angela encourages us to view the development of our natural intuition not as a chore but as a great adventure. So how do we embark on this adventure? 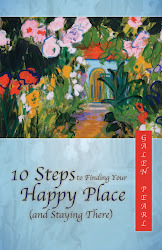 The book is chock full of practical exercises and guided meditations. Instructions are clear, and progress can be easily achieved and verified. If you try even some of her suggestions, you will see results. There is no way to fail. Yet we do encounter blocks to intuition, for example, the need to be right, or the need to control. These jumped out at me because they are also blocks to experiencing joy. These and other blocks are based in fear. Angela gently guides us through steps to acknowledge and release the fear, so that our intuition (and joy) can flow freely. And once your intuition is flowing freely, it will guide you to your greatest passion, your highest purpose, and your most authentic life. Furthermore, Angela explains how en masse, this will change our world as we evolve from the Age of Technology to the Age of Intuition. As a person still trying to figure out Facebook and my new TV, I can’t wait for that! 1. You will love this book. 2. It will change your life. 3. After we all read it, our collective fabulousity factor will light up the world. There was a TV show in the US when I was a child (long ago!) called Queen for a Day. It was an early version of reality game shows. Various women would come on the show and tell their sad tales of woe, including what they wanted most, often something like a washing machine or medical help for a sick child. After the stories were told, the audience would clap for their favorite, and one woman would be chosen as the queen based on the level of applause. She was crowned and draped in regal robes, and seated on a throne. Her wishes were granted, and other prizes were awarded. Although the show, like many of its ilk, was embarrassing and humiliating, the concept was alluring. Here were women often overlooked as they went through their lives of challenge and sacrifice. One of them would be singled out as special and celebrated. Aunt Bernice was no one famous or powerful. She spent her days tending to her family. I adored her. My friend Tom and I took her out to lunch one day. Tom is famous and powerful. A graduate of Harvard Law School, an influential lawyer, a man used to being listened to. But on that day you would not have known it. He treated Aunt Bernice like she was queen for a day. He held her chair, made sure her food was to her liking, asked her about her family, listened attentively to the stories of her childhood, stories I grew up with. Like this one. As a young girl, Aunt Bernice liked to go down to the creek. One day, she heard someone coming, and hid in the bushes. Along came a boy she knew riding on a mule. He spied her in the bushes and called out to her. She was too embarrassed to reply, so she picked up a rock and threw it at him, striking the mule which then bolted up the creek. She ended up marrying that boy. Oh, she told it so much better than that. As Tom listened, Aunt Bernice grinned with pleasure, the deep lines in her face crinkling up like brittle paper. And I grinned with pleasure, too, watching her enjoy herself, grateful to my friend for his gallantry and kindness. The way he treated my aunt made a much bigger impression on me than all his elite degrees and prestigious positions. When I commented later on his graciousness, he said that his father taught him that all people deserve our attention and respect, that we should make everyone comfortable in our presence. Wise dad, that one. Aunt Bernice died just before her 100th birthday, leaving a legacy of children, grandchildren, great grandchildren, and great great grandchildren. I have many treasured memories of her, but that lunch stands out to me. She was queen for a day that day, as she was in my heart every day. Is there someone in your life who deserves to be queen or king for a day? related post: Who are Your People? Several times recently, a question has come up in conversation. Who would you want to meet if you could meet anyone, living or dead, fictional or real? I would want to meet Bruce Lee. Yes, because of his legendary martial arts skills, but not only because of that. Bruce Lee embodied, literally, the philosophy of the Tao Te Ching. He revolutionized martial arts with an approach described as the way of no way. He believed that the various styles of martial arts limited one’s abilities by requiring adherence to rigid forms and techniques. He dropped the distinctions and integrated all styles to be responsive in the moment. His personal philosophy paralleled his martial arts philosophy. “You can’t organize truth. That’s like putting water in wrapping paper and trying to shape it.” “Be water, my friend.” He was educated and intelligent, a deep thinker who wrote and spoke eloquently about a way of life that focused on inner awareness and enlightenment. His personal life was a profile of the American way. Unlike most martial arts teachers of that time, he did not restrict his students to his own ethnic group. In spite of vigorous opposition, he opened his classes to anyone who wanted to come, regardless of race or gender. He married a white woman at a time when interracial marriages were rare and even dangerous. But one of the ways he most influenced my life might not have really been part of his life at all. In Dragon, a movie about his life, there is a theme that resonated in my soul. A demon appeared to him at various times, as if in a dream or vision. Each time, he was terrified and helpless. When he spoke to his teacher about it, the teacher explained that the demon was his father’s demon, passed down to him. The teacher said that he would have to fight the demon. When Bruce protested, the teacher stated, “You will fight the demon to save your son.” In the last encounter, Bruce saw his son threatened by the demon and found the courage and strength to fight and vanquish it. I believe that many of us carry the “demons” of our parents, as they did for theirs. We pass these on to our children, often unknowingly, certainly unintentionally. By the time I saw this movie, I was aware of certain things in my own life that I recognized as issues my mother struggled with. I’m guessing her mother did, too. Perhaps these issues stretched back for generations, being passed down from mother to daughter. I began to see that at some level I was already starting to pass my inherited demons on to my daughter, in spite of my determination not to. The only way to prevent it, I finally acknowledged, was for me to deal with the issues in my own life. There was no other way to protect my children. That demon theme in Dragon might have been a fictionalized addition to Bruce Lee’s biography, but it had a very real impact on me. Watching the story made me realize that, like Bruce Lee in the movie, I would have to fight. What I had up till then been unwilling to do on my own behalf, I was determined to do for my children. The legacy was going to stop with me. The changes in my life that led to the 10 Steps to Finding Your Happy Place have their roots partly in the story of Bruce Lee, at least as it was told in the movie. If I could meet anyone, he is the person I would want to meet. What about you? Who would you meet if you could? The term “game change” refers to those moments when a play is made that changes the tide of the game, shifting the momentum from one team to the other, setting the tone for the remainder of time on the clock, foreshadowing victory or defeat. It has become a sports metaphor for that type of event in many contexts, like campaigns, wars, marriages, careers, and life. It’s that moment when everything changed, when the wind shifted, or the sun broke through, or the tsunami hit. At the time, we may not even recognize its significance, but in hindsight we know that our life was not ever the same after it. Click here to read the rest at Life, for instance. Please leave a comment there to share a game changing moment in your life. Is there any mother whose heart has not been broken by her children? By loving them so much, by worrying about them, by losing them, by finding them again? One mom I know has a child with leukemia. Another has a child on drugs. Another’s child died in a fire. A friend’s daughter has morphed into bridezilla. Another has a teenager who is, well, a teenager. I have two sons with autism. What were we thinking when we had these kids? I have never regretted for a moment having them, but I have marveled sometimes that I don’t. Surely I would regret anything else in my life that had caused me such heartache. Would any of us, if we really really knew what we were getting ourselves into, have knowingly walked into this soul pain? Years ago, when I was married and thinking that it was a good time for me to have kids, a friend with two young ones of her own passed along this advice. “Don’t have kids until you can’t stand not to.” Although the time seemed optimum, the truth was that I could stand not to, and so I waited. Some years later, single and working overseas, adding children into my life seemed ridiculous. And yet, the drumbeat of desire beat ever faster and louder until the yearning could no longer be denied. And so I adopted James, a newborn. I flew back to the US to get him. My first week as a mom was spent at the US Passport Agency getting him a passport, and then at the Thai embassy to get him a visa so I could take him on an airplane for 27 hours home to Bangkok. Not the typical entry into motherhood! The years brought four more children – one a toddler, and three teenagers. Where to look for guidance? Even after all these years, I think the best parenting model I’ve ever seen was a dog. My dog had seven puppies in the whelping box I had made for her in the corner of my kitchen. It wasn’t long before I recognized a pattern. When her puppies were sleeping all in a heap, she used the time to catch up on her rest, too. As they began to stir and whine for food, instead of responding to them right away, she would do a cursory check on each and then leave the box and go to her food dish. There, she would eat calmly as the yelping grew more frantic and insistent. After eating, she would drink some water and then go out in the back yard to attend to her own needs. Only then did she return to the box, and give herself over to her puppies’ mad scramble for a place at the table. I never saw her short tempered with them until it was time to wean them. This she accomplished with little fanfare. She simply walked away from her little pack of puppies as they jumped after her trying to latch on. She sternly but gently nipped at the ones who didn’t get the message that the kitchen was closed. She didn’t stop loving them, but she let them know it was time to grow up. I didn’t follow her model entirely. I have sometimes been a bit more like the bird I just watched outside my window as I sit here typing. A baby robin is sitting in the rhododendron and the parents keep flying up to it and feeding it. Even after the babies are out of the nest, I see the parents continuing to feed their adolescent offspring. If you have seen a baby robin, it has the perpetually frowning, disgruntled expression we would recognize on many teens’ faces. And yet the parents still spend their days catering to its hunger. There were times when I had to remind myself to be more of a dog and less of a bird. The day to day needs of my children are no longer my responsibility. Letting go is hard. Letting it be, as the song advises, is often even harder. They have their own lives now, two of them with babies of their own. They do sit on the branches occasionally, chirping for some parental TLC, which I am happy to provide. PS–I’m sure fathers’ hearts break just as easily, and I do not mean to exclude them. But my experience is as a mom, so I write from that place today. Nor do I mean to exclude people who do not have children. There are many ways to love, and all of them, at their deepest level, break our hearts wide open. Saying Yes to Change is the title of Alex Blackwell’s new book. I loved the title before I ever started reading the book, and things just got better from there. If you don’t know Alex yet, he writes The Bridgemaker, one of my favorite blogs. I’m coming late to the book review party, so you may have already read some of the many excellent reviews and interviews. At one point, I wondered what I could possible add to the plethora of praise pouring out over this book. (I love the word “plethora” and look for opportunities to use it!) But I realized that every reviewer or interviewer was taking a personal message or lesson from the book, so that no two reviews were the same. And that, I think, is the highest praise. What that means is that this book has an important message just for me. And for you, too. Alex begins by telling a story, his story, the story of a painful childhood. He tells it in stark and moving honesty, yet without self pity. The scars left were some that many of us can relate to – perfectionism and denial. I knew them both well for much of my life. As Alex describes getting to the point in his adult life when he knew it was time to change, I was so excited. Anytime anyone says yes to changing his life, then all of us benefit and can be inspired to change our own. To help us along, Alex offers 10 life lessons, simple and direct, blending his story with the wisdom he has gained. Each lesson is broken down into strategies that are easy to understand and immediately applicable in our daily lives. Change isn’t far in the future. We can start right now. As I said, the beauty of the book is that there is a special message in it for each of us. All the lessons are ones that all of us, I think, will relate to and benefit from. But one, perhaps, will stand out just for you. For me, it was the second one, “Find freedom from pain.” Just even reading those words hit a tender, raw place in my heart. I took a deep breath and read on. Our typical way of dealing with pain is to deny it or try to escape it. The first step in finding freedom from pain, Alex says, is to acknowledge it, and the second is to accept it. No denial. No escape. Not such an enticing idea. But the payoff is freedom. Soul healing, spirit lightening, freedom. When pain is no longer so scary, when we no longer try to beat it into submission or hide from it, it becomes a doorway to freedom. Buddhists teach about the “suffering of suffering.” In other words, when life’s inevitable challenges come knocking, we spend so much effort struggling with them that we become locked into pain. Instead, we could, as Alex suggests, simply allow, release, let go. Refocus on our beauty and strengths, on the blessings that accompany all of life’s unfolding. So much of life’s pain comes from our resistance to change. In her book Open the Door, Joyce Rupp quotes a poem about change, the last line of which is “Change is beautiful; you will learn to love it.” The poem was written by a 12 year old girl who died in a car accident the day after she wrote it, making the poem even more poignant and perhaps even prescient. We don’t know the details of tomorrow’s gifts, but we do know that the gifts will come wrapped in change. Alex’s book Saying Yes to Change helps us learn to love it. Click here for more information about the book and how to buy it. Assumptions. We all make them. Most of the time we don’t even realize it. And most of the time, they do no harm. But sometimes they separate us in quietly insidious ways. That doesn’t make us bad. It makes us human. But what happens when we catch ourselves making these assumptions, when we question them, when we consider that the beliefs we hold based on these assumptions are built on shaky ground? Click here to read the rest at The Bridgmaker.